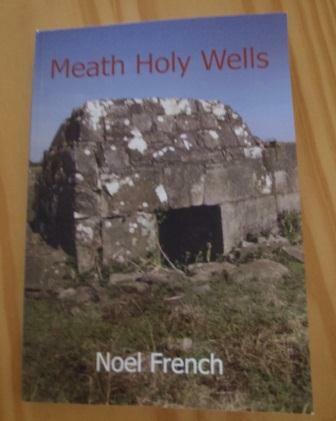 I had a lovely surprise this week, I received a gift from my friend Muireann of a newly published book on holy wells called Meath Holy Wells by Noel French. Holy wells have always interested me. They are really are special and peaceful places. Given that there are approximately 3000 holy wells in Ireland they are many wells scattered around the country that I am unaware of and I must confess until now I knew little of the wells in Meath. So what is a holy well? A holy well is a natural spring or natural or man-made hollows ( bullaun stones) in rock which collect with water, deemed to have a religious significance through association with the saint. The history of devotion at holy wells is complicated, the earliest references to the Christian use of holy wells date to the seventh century but many are likely to have prehistoric origins and were apropreiated by the new christian church in the 5th and 6th centuries. I think a small number were originally used for domestic use and developed into pilgrim features in the post medieval period. Without medieval documentation for a wells or excavation the dating of many of these monuments are very difficult, although a dedication to an early medieval saint suggests at least an early medieval date. 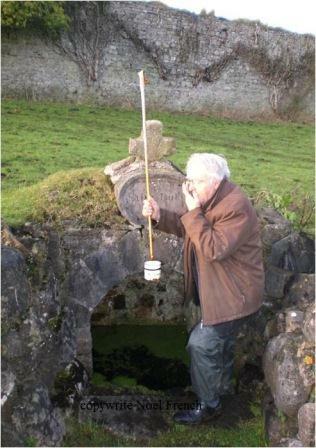 Holy wells can occur in isolation but many are located close to ecclesiastical enclosures. There are found in both rural and urban landscapes. The majority of literary accounts of pilgrimage to holy wells date to the post medieval period, although a handful of holy wells are named in the medieval literature and its likely the tradition of pilgrimage to the well goes back to prehistoric times. 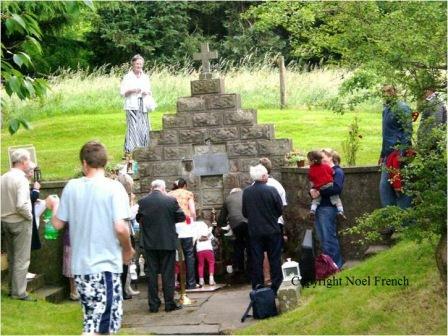 In many case usually on the saints feast day there were special religious devotions at the well, people would gather and perform special prayers and rituals ( rounding of the well ) on what was known as the pattern day. The word pattern derived from ‘patron’ in reference to the patron saint, so pattern day refers to the patron saints day . There are many account of post medieval and modern pilgrims leaving votive offerings at wells such as pins, coins, buttons, holy medal and treads from shawls. Cruthes were left at Fr Moores well in Kildare. Even today at popular well pilgrims leave behind rosary bead, candles, inhalers etc. The book, Meath Holy Wells records approximately 123 holy wells. The Meath wells are dedicated to a wide range of Irish saints such as Patrick , Colmcille, Brigid, Kieran. Universal saints include the Blessed Virgin , Anne, Lucy and Nicholas. Each well is described and many accompanied by a colour photo. All the traditions and folklore of the wells are recorded. Like elsewhere in the country many of the Meath wells are associated with healing, the waters of St Seachnaill’s well, Dunshauglan were said the cure swelling of any part of the body, while the waters of St Ultan’s well Ardbraccan were a cure for sore eyes. I discovered an astonishing fact in the introduction, that the Meath archaeological Survey ingnored these wells and the County Development plan lists only 3 wells. This is shocking when one considers the significance of these monuments. Holy wells are of great cultural value and as wells cease to attract pilgrims they become ever vunerable to being destroyed. I was delighted to read that a significant number, such as St Johns well at Warrenstown are still the site of active pilgrimages. This book really showcases the value of the holy wells of county Meath and it will hopefully make the people of Meath aware of their significance and go along way to help in their preservation for future generations. This is really a lovely book and perfect for dipping in and out of . If anyone is keen to find out more about the holy wells of Meath, the book Meath Holy Wells – PRICE €15, is available at Maguires, Hill of Tara, Newgrange, Antonia’s, Trim, Siopa an Caislean, Trim and Post Office, Trim. Also by post from Noel French, Castle Street, Trim for €15 including postage. This entry was posted in Holy Well, Medieval Pilgrimage, Pattern Day, Uncategorized and tagged Dunshauglan, holy well, Holy wells of Meath, Killua, Meath Holy Wells by Noel French, St Johns well, St Seachnaill's well, St Ultan Ardbraccan, St. Lucy's Well, Warrenstown.